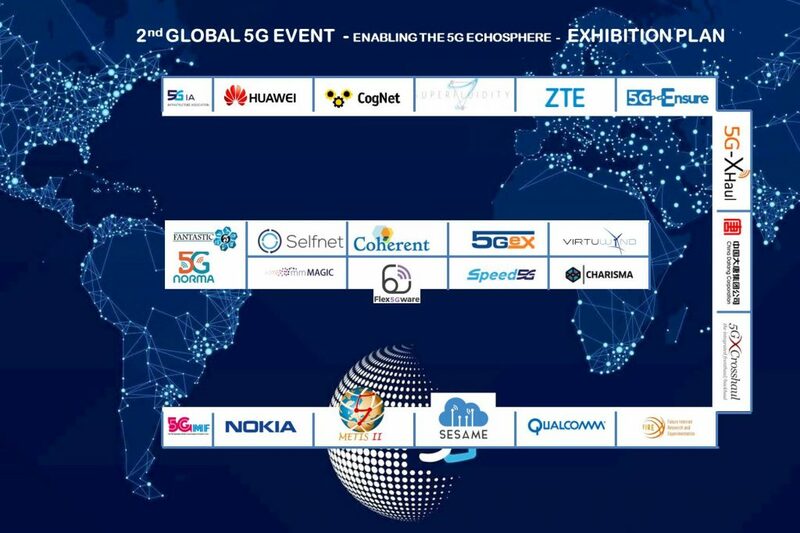 The 2nd 5G Global Event which will be held in Rome, Italy in November 9 and 10 is organised by the European 5G-Infrastructure-Association in co-operation with IMT-2020 (5G) Promotion Group, the 5G Forum, the 5G Mobile Communications Promotion Forum, and 5G Americas. The event will offer participants both Lively debates around spectrum, standards and deployment of 5G as well as exciting showcases of the latest 5G developments from industrial players such as Datang, Huawei, Nokia, Qualcomm and ZTE, And the latest results and demos from 17 5G PPP projects: 5G-CROSSHAUL, 5GEx, 5G ENSURE, 5G-NORMA, 5G-XHAUL, CHARISMA, COGNET, COHERENT, FANTASTIC-5G, FLEX5GWARE, METIS II, mmMagic, SELFNET, SESAME, SPEED-5G, SUPERFLUIDITY and VIRTUWIND. The exhibition of the demonstrations will be open in parallel to the conference for the two days and participants will be encouraged to visit the stands during the breaks or at whatever opportunity they have. Registration costs 250 Euros (taxes and charges included). ➧ Do not miss the opportunity and register online here. 5G ENSURE published late August 2016 its initial study on risk assessment, mitigation and requirements. It marks a first step towards defining a risk assessment and mitigation methodology to be followed for the specific task of evaluating the 5G security uses cases and architecture proposed by the project. The final version of the study, which will be published soon, will further refine the methodology after examining each of the approaches, especially for factors such as risk severity, impact and the level of control of remediation. In addition, it will provide a full threat analysis (including ‘external’ threats coming from other sources than 5G-ENSURE use cases), their categorisation, prioritisation with regard to severity and impact, as well as complete mitigation and remediation recommendations, functional requirements and architectural options. It will also define relevant metrics for use of security monitoring, and penetration tests over the security test bed and gap analysis. 5G ENSURE also published first steps of its trust model. Firstly terminology is discussed and defined. Secondly work on machine trust is reviewed: machines of course only follow the instructions given to them through their software code by humans, but we review what the options are and the indicators for trustworthiness of other entities, whether they are humans or machines. Finally trust and trustworthiness by design techniques is looked at: 5G ENSURE recommends for use both during the design of 5G and when changing the design of a 5G deployment by adding or removing elements. To understand 5G networks we must first understand 4G networks, and this is what is covered in the next chapter, looking first at the actors and business models of 4G (including where they touch on satellite services) and then extracting the trust aspects of the 4G network. Following this the actors and business models expected to change are examined as 5G brings in new domains and new opportunities for operators (both terrestrial and satellite). Here, the majority of the 5G use cases identified by 5G-ENSURE in an earlier document, identifying the entities involved and the trust issues in each one,are screened. The final chapter brings all this information together to firstly discuss privacy aspects, then analyse the relationships between 4G stakeholders (demonstrating surprising complexity even there) and finally lay out a proposed approach for the work in 5G-ENSURE which will culminate in a machine understandable trust model able to assist stakeholders in managing risk. Save the date in your agenda! The 38th annual DigiWorld Summit will run from 15 – 17 November 2016, and have as its central theme: The Internet of Trust. It will be an opportunity to engage in a meaningful international debate over digital trust issues – starting with security and privacy – which have become major sources of concern for all of the ecosystem’s stakeholders. As the number of reported cyber-attacks worldwide is growing by close to 40% a year, we expect that upcoming stages in digital technologies’ evolution will only amplify the phenomenon. And this to such an extent that any future scenario is possible: from a continuation of the current chaos to a breakdown in trust that would lead to the construction of a new digital economy, which will no doubt differ in many respects from the one we know today. • Are we reaching a tolerance threshold for online trust? • How can veteran digital industry players (equipment suppliers, telcos, IT companies) capitalise on the current climate? • Are verticals threatened by the situation or, on the contrary, on the winning side of trust and security issues? • Do we need a new regulatory framework to govern, or reassure, market players and consumers? ➧ Follow up and read more on the digiworld website and register online. METIS-II, FANTASTIC-5G, mmMAGIC, 5G-Crosshaul, Flex5Gware 5G PPP projects are jointly organising along with IEEE Globecom 2016 the 2nd International Workshop on 5G RAN design on 8 December, 2016 in Washington DC, USA.